Hi! I am an English teacher just trying to do my best every day. 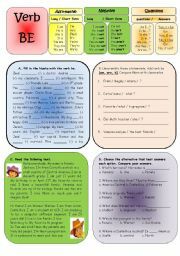 This material is useful for practicing the verb be. I hope you use it a lot. Thanks to all of you for sharing! In this worksheet students will complete the statements with the correct occupation and they will match the numbers of each statement with their corresponding picture. 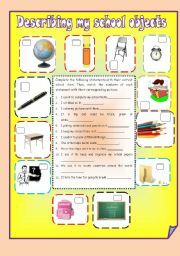 It is a handy worksheet, specially designed for learning vocabulary related to the school objects. I hope you like it. Hi dear friends! This task is quite useful when we are studying Parts of the Body or just practicing vocabulary.It also has a B&W worksheet as well as the asnwers. I hope you like it! 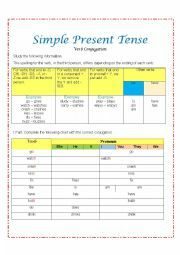 Dear friends This a worksheet designed to practice the simple present tense and the third person rules. Have a nice day! 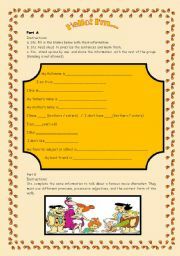 This set of questions can be given to the students who enjoy participating in short conversations. Students can use it to make a roleplay or in an interview, they also can answer the inquiries to reinforce grammar. This activity was thought to review questions. 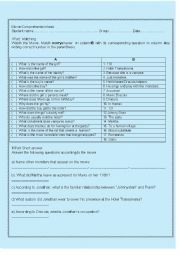 Students enjoy a lot watching movies in English so that this worksheet supports the teacher�s work meanwhile the students have fun.Be free to modify it. Hi! 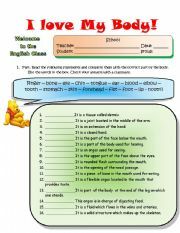 This worksheet is useful for working in oral activities, specially beginners. They like to participate when the environment is relaxed. The picture was taken from google. This presentation will help your students to learn vocabulary. Each word will move to the picture to illustrate the corresponding body part. I hope you like it. The image is an adaptation from one gotten from google. Thanks to those who design such beautiful pictures! This power point presentation is interactive, you can use a video beam and show it to the whole class and ask them to participate actively, your students will learn about different jobs and have fun at the same time. I hope you like it.. Be free to make any change to improve it to your own use. This online exercises are addressed to practice the verb to be. There are one choice and complete activities.